Aims: To assess whether a strategy of invasive management without stents in selected acute coronary syndrome (ACS) patients with a large thrombus burden (LTB) might be feasible and safe. Methods and results: We performed a prospective non-randomised observational cohort study of invasive treatment decisions guided by optical coherence tomography (OCT) in selected ACS patients with LTB. Among 852 ACS patients who had undergone invasive coronary angiography, 101 (11.8%) patients with large thrombus burden on initial angiography underwent thrombectomy to restore TIMI 3 flow without stenting. All of these patients then had repeat angiography with OCT (days 0-2 [Group 1], days 3-6 [Group 2] or days 7-30 [Group 3]). No adverse events occurred between the initial and second angiograms. Residual thrombus was detected in 68% of patients with OCT (respectively, 94%, 79% and 32% in Group 1, Group 2 and Group 3), and 20% of cases with angiography. Plaque rupture was detected by OCT in 65% of cases. Minimal lumen area was 2.81 mm2, 3.40 mm2 and 4.89 mm2 in Group 1, Group 2 and Group 3, respectively. Sixty-two percent of patients were stented (respectively, 76%, 61% and 50%). During a minimum follow-up period of 12 months in all patients, one non-fatal MI occurred and one PCI was performed for angina. Conclusions: Medical management without stents is safe and feasible in selected ACS patients with LTB. OCT revealed culprit lesion characteristics that were not disclosed by angiography and facilitated treatment decisions. Early invasive management in patients with an acute coronary syndrome (ACS) is supported by evidence-based clinical guide- lines and, overall, prognosis has improved in recent years. In ACS patients treated with PCI, stenting is almost always performed. The purpose of stenting is to prevent acute vessel closure after reperfusion. However, although stenting is routinely performed, stents can cause complications acutely (e.g., distal embolisation, stent thrombosis) and in the longer term (e.g., restenosis and late/ very late stent thrombosis). In ACS patients, coronary thrombus is a consequence of plaque rupture, and persistent or large coro- nary thrombus (LCT) is a risk factor for adverse outcome after percutaneous coronary intervention (PCI) with stenting1. Stent deployment in a thrombotic lesion may dislodge thrombus, leading to microcirculatory embolisation with a no-reflow effect on reperfusion2, which is a cause of heart failure acutely and in the longer term. Furthermore, stent outcomes may be suboptimal in thrombotic lesions due to malapposition of the stent on the coronary wall, and stent malapposition may also lead to adverse outcomes in the longer term. Large thrombus burden (LTB) (defined by Sianos et al as a thrombus with length more than twice the diameter of the coronary artery) is also associated with an increased risk of late stent thrombosis3. Reduction of thrombus burden during PCI improves procedure-related outcomes and is recommended in clinical guidelines. For example, the TAPAS study4 showed that mechanical thrombectomy improved myocardial blush and reduced the rate of 30-day major adverse cardiac events (MACE)5. We questioned whether stenting could be safely avoided in selected patients with LTB and could therefore potentially obviate the risk of complications associated with stenting. Given the emergence of new antithrombotic treatments and improved lesion assessment with intravascular imaging techniques, such as optical coherence tomography (OCT)6, we reasoned that stenting may not be mandated in all patients. OCT is a high-resolution (10 μm) endo- coronary imaging technique based on near-infrared light. It provides fine in vivo analysis of the three-layer structure of the arterial wall and of atherosclerotic lesions, and highly sensitive thrombus detection7. OCT has been used since 2005 for imaging ACS culprit lesions8 and for immediate9 and late (neointimal cover10) post-pro- cedural stent follow-up. The present study concerned the feasibility, safety and clinical utility of OCT-guided treatment decisions in ACS patients during routine clinical practice. Our rationale was that detailed assessment of thrombus and culprit lesion characteristics by high-resolution endocoronary imaging could guide treatment decisions for coronary stenting after thrombus aspiration. Between January 2010 and November 2011, 852 patients were admitted for ACS in two French hospital centres (Clermont-Ferrand University Hospital Centre and Marie Lannelongue Surgical Centre, Plessis-Robinson). One hundred and one ACS patients were included in the present observational study. – a culprit coronary artery amenable to OCT imaging (including vessel diameter <5 mm without significant tortuosity or calcification that might restrict the optical catheter). – known creatinine clearance <30 ml/min. All patients received treatment with 250 mg of aspirin, a loading dose of clopidogrel or prasugrel and therapeutic anticoagulation. A flow chart which summarises the decision pathway is shown in Figure 1. The timing of the OCT procedure was at the operator’s discretion during the first month after the acute phase. The initial objective was to achieve optimal reperfusion by thrombus aspiration (Export aspiration catheter; Medtronic, Minneapolis, MN, USA) and treat the patients with optimal medical therapy including aspirin, a loading dose of clopidogrel or prasugrel and a bolus of abciximab in line with clinical guidelines. Optimal reperfusion was defined in the presence of TIMI flow 3 associated with regression of pain and >50% reduction in ST elevation at the post-intervention ECG. Coronary stenting was indicated when one or more of these characteristics was absent. Alternatively, when optimal coronary reperfusion was achieved, the treatment decision (based on a second angiogram and OCT analysis) could, at the operator’s discretion, be immediate or else postponed to allow time for the beneficial effects of optimal antithrombotic therapy, including dual antiplatelet therapy, glycoprotein IIb/IIIa inhibitor therapy and anticoagulation with low molecular weight heparin. Three study groups were defined according to the timing of repeat OCT imaging: acute OCT (days 0-2), early OCT (days 3-6) and late OCT (days 7-30). The different time points (acute, early and late) were predefined in order to assess the relationship between the interval from the initial angiogram (and duration of antithrombotic therapy) vs. culprit lesion morphology, as revealed by OCT. The indication for a stent was based on a stenosis >70% or plaque prolapse as revealed by OCT. The three criteria required to define plaque prolapse were: (1) an appearance of a mobile plaque in continuity with the coronary wall with (2) evidence of plaque prolapse into the lumen and (3) a maximal plaque length exceeding one third of the arterial diameter. All patients received optimal medical therapy, including some patients who did not receive a stent and instead received optimal medical therapy alone. When PCI with stenting was performed, OCT was used to assess the final stent result including stent malapposition, defined as a strut/wall distance greater than the thickness of the strut (including polymer if any)11,12, significant intra-stent thrombotic protrusion (intraluminal tissue protrusion forming an arch between the stent struts11,12, considered moderate when less than, and significant when more than, 500 μm thick), or proximal/distal edge dissection (upstream or downstream: edge dissection). Angiographic measurements were taken in the Axis Siemens cath- lab (Siemens Medical Solutions Inc., Malvern, PA, USA) after intracoronary injection of isosorbide dinitrate. The following measurements were obtained: baseline TIMI flow, percentage stenosis on quantitative coronary angiography (QCA) (Siemens QuantCor; Siemens Medical Solutions, Forchheim, Germany), arterial reference segment diameter (mm), minimum arterial diameter (mm), and thrombus length (mm). For an occluded culprit artery, thrombus length was determined from the first angio- gram after coronary reperfusion. Angiographic analysis was performed by two independent investigators who were not involved in the clinical procedures. Disagreements were resolved by adjudication by a third observer. The technique of OCT acquisitions (frequency domain OCT, version C7XR; St. Jude Medical Inc., St. Paul, MN, USA) was in line with recent expert review documents13,14. OCT analysis focused on: the presence of thrombus11,12; thrombus burden, based on its extension (thrombus area, longitudinal extension) and thrombus score11,12; reference segment lumen area; minimum lumen area; percentage area stenosis; and presence of plaque rupture or erosion. OCT analyses were performed by two independent investigators, specifically addressing the feasibility and interpretability of images of region of interest in each examination, and any procedure-related complications. Follow-up included screening for MACE (death, recurrence of myocardial infarction or need for surgical or percutaneous revascularisation) and functional assessment (recurrence of angina) on systematic 12-month post-procedural consultation. Statistical analysis was performed using Stata software, version 12 (StataCorp LP, College Station, TX, USA). The tests were two- sided, with a type I error set at α=0.05. Quantitative parameters were presented as the mean±standard deviation (SD) for each group and as the number of patients and associated percentages for categor- ical variables. Comparisons between groups were analysed using the chi-squared or Fisher’s exact test for categorical variables followed by Marascuilo procedure, and by ANOVA or Kruskal-Wallis test (normality verified by Shapiro-Wilk test and homoscedasticity by Bartlett test) followed by appropriate post hoc multiple com- parisons test (Tukey-Kramer or Dunn) for quantitative variables. In a second step, relations between different parameters and groups were improved considering the delay as a quantitative parameter (and not as three groups determined by clinical and statistical relevance). When appropriate, correlation coefficients (Pearson or Spearman) were used. Of 852 all-comer ACS patients treated in our hospitals between 1 January 2010 and 1 November 2011, 101 (11.8%) patients (53±13 years, 78% male; 94% STEMI, 6% NSTEMI) were included. These patients had an LTB in the culprit artery on initial angiography and were treated with aspiration thrombectomy. Twenty-two percent of these patients were treated with pre-hospital thrombolysis. The clinical characteristics of the patients are shown in Table 1. Overall, 38 (38%) patients did not receive a stent in the culprit lesion and were treated medically. 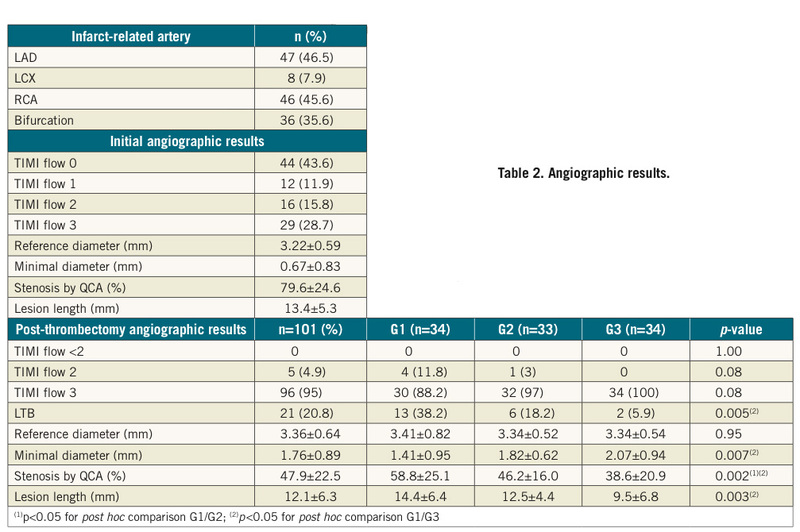 The results of the initial and subsequent angiograms are shown in Table 1 and Table 2, respectively. 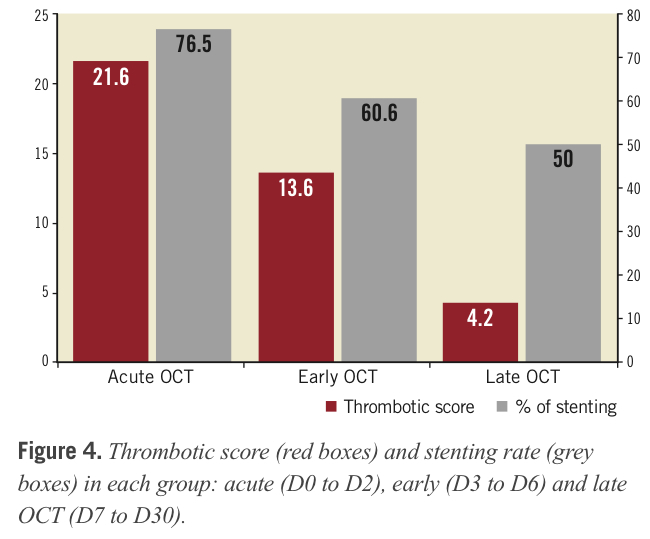 OCT was performed at days 0-2 (Group 1, including n=18 patients with immediate post-thrombectomy analysis), days 3-6 (Group 2) or days 7-30 (Group 3). Stenting was performed when the residual stenosis in the culprit lesion was >70% of the reference area or when there was evidence of plaque prolapse. Clinical follow-up lasted for 12 months. The OCT procedure was uncomplicated in all patients and all of the OCT recordings were of diagnostic quality (Table 3). Thrombus was revealed in 68.3% with OCT and 20.8% of patients with angiography alone. Thrombus burden diminished over time and was revealed by OCT in 94.1% of patients in Group 1, 78.8% of patients in Group 2, and 32.4% of patients in Group 3, with mean thrombus scores of 21.6, 13.6 and 4.2, respectively. Thus, maximum thrombus area and length also diminished over time with sequential increases in minimum lumen area and reduced percentage stenosis across the groups. Mean lesion length was 13.5 mm and was less than 15 mm in 70% of cases. Plaque rupture was disclosed by OCT in 66 patients (65.3%) (Figure 2). In these cases, fibrous cap thickness ranged from 30 to 210 μm, for a median 73.6 μm. Plaque erosion was diagnosed in 25 patients in the absence of thrombus or rupture: 22 of 25 patients with plaque erosion suspected were in the non-immediate groups (n=7 in the G2 and n=15 in the G3). There were only three patients in the first group. 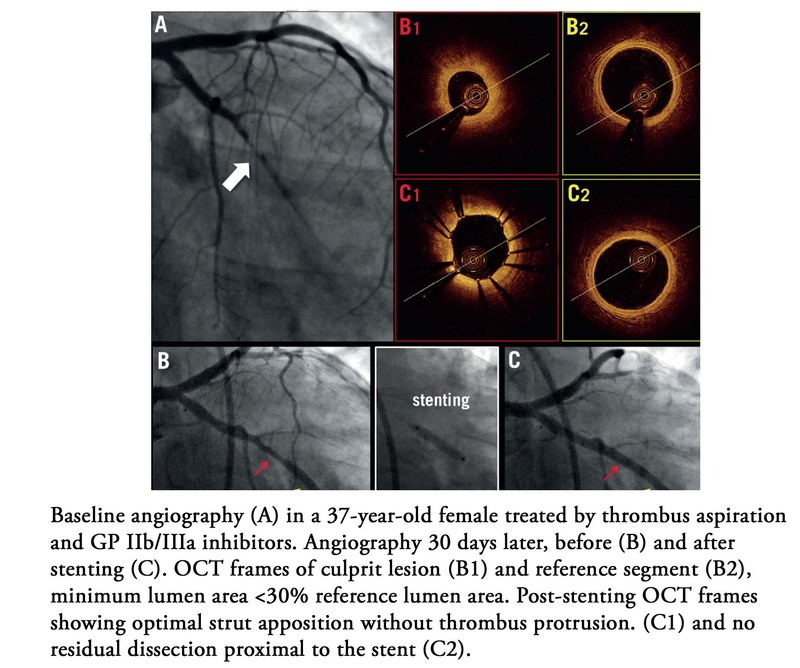 In 10 other patients the shadow related to light attenuation by residual thrombus precluded diagnostic evaluation of the lesion: the diagnostic value of OCT is reduced in cases with red thrombus. The treatment and follow-up information are given in Table 3. All patients were treated by dual antiplatelet therapy (DAPT) and received low molecular weight heparin (LMWH) anticoagulation during the initial hospital phase. LMWH was stopped when patients were discharged from the hospital. A total of 27 patients out of 101 were discharged from the hospital before the second angiography. Only 63 patients (62.4%) underwent coronary stenting and no complications occurred. The mean stent diameter was 3.40±0.6 mm and the mean length was 20.4±7.1 mm. In all 63 patients, only one stent was implanted per lesion, including nine with bifurcation lesions which had been managed by provisional T-stenting. The other 38 patients were managed medically. None required a coro- nary artery bypass graft. Two MACE events occurred (2%) during 12 months of follow- up. A 71-year-old man who had been managed medically experienced angina and had a clinically indicated elective angiogram which showed culprit lesion progression which was treated with a drug-eluting stent. An 83-year-old man managed by angioplasty showed non-fatal ischaemic ACS at eight months post procedure. There were no cases of sudden death or myocardial infarction. Our main finding is that, using stratified management involving a staged approach with invasive management selectively guided by OCT combined with optimal antithrombotic therapy, nearly half of the ACS patients selected for this form of management were safely treated without a stent. In all, nearly one eighth of all-comer ACS patients in our hospitals were selected for this treatment pathway. 6) angiography underestimates thrombus bur- den, detecting 20.8% residual thrombus after thrombectomy versus 68.3% on OCT. Pathology studies by Virmani et al have shown that ACS are most often due to plaque rupture or erosion13, and these observations have subsequently been confirmed on IVUS and on OCT13,14. Fibrous cap thickness is critical to onset of these complications, thickness <65 μm being associated with high risk of rupture15. The underlying stenosis is not necessarily tight, as the thrombotic com- ponent predominates in arterial occlusion. In case of LTB, stenting incurs a risk of no-flow, distal embolisation16 and malapposition. Kim et al, using OCT17, showed that late stent malapposition and neointimal coverage defects were observed more frequently in ACS than in chronic angina. Historically, culprit lesion stenting has been the evidence-based standard of care for coronary artery disease amenable to PCI in ACS patients. However, several groups are re-examining this approach, and new treatment strategies are now emerging. The two-step Minimalist Immediate Mechanical Intervention (MIMI) strategy of Isaaz et al18 consists of restoring TIMI flow 3 in the acute phase and postponing stenting from D0 to D2-5 to allow optimisation of the result or indeed reconsideration of indications. Contemporary antithrombotic therapy, including glycoprotein IIb/IIIa inhibitor therapy, dual antiplatelet drugs, and anticoagulation, facilitates the safety of an observational approach, minimising the risk of early thrombosis. A recent meta-analysis by Freixa et al19 of six studies (five non-randomised) found deferred stenting to be safe (three coronary re-occlusions before control, in 283 patients) and beneficial (improved LV function), with a lower one-year MACE rate. The present study applied this two-step strategy, with the interval to control (up to day 30) left at the operator’s discretion while awaiting optimal thrombectomy using GP IIb/IIIa inhibitors and/ or thromboaspiration as often as possible (respectively, 76.2% and 72.3% of cases). Our results confirmed the feasibility and safety of this strategy: in 101 patients, there were no MACE before angiogram two, taken at a mean nine days (median, five days). Our study also confirmed that, in a setting of ACS, OCT was feasible, with no procedural complications in any of the 101 patients. OCT provided consistently interpretable imaging. The new generation of OCT (optical frequency domain imaging [OFDI]) is faster and simpler to perform. 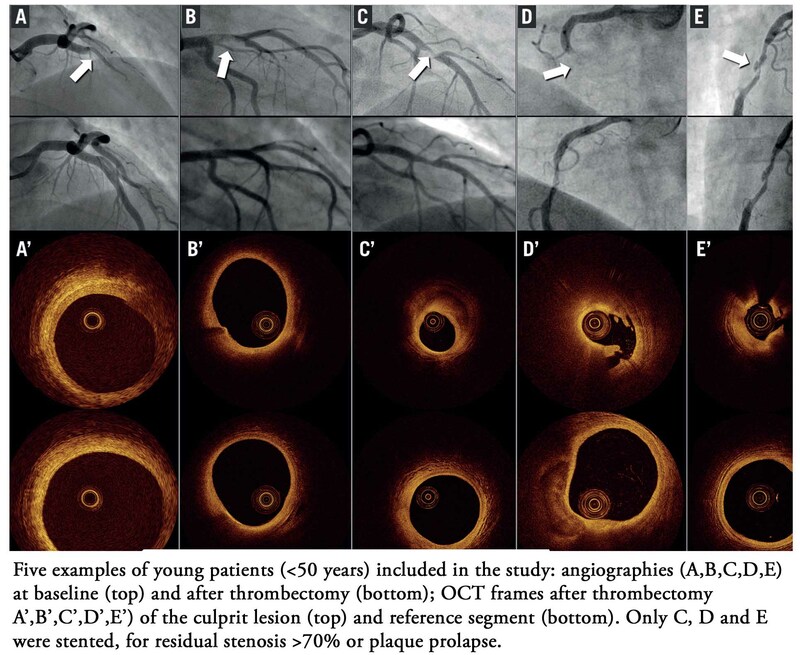 OCT enables analysis not only of thrombus burden but also of the ACS culprit lesion, with Kubo et al7 demonstrating its superiority to angioscopy and IVUS: in this pilot study, OCT in the acute phase visualised thrombus in 100% of cases, plaque rupture in 73% and erosion in 23%. In 101 cases of ACS, the present study identified 66 plaque ruptures (65% of cases) with a mean cap thickness of 73 μm, and 22 plaque erosions. Finally, OCT can guide treatment, optimising stenting, and some- times indicates isolated medical therapy. By sometimes postponing angiographic control, more complete thrombus regression can be obtained, with improved assessment of the atheromatous component of the stenosis. Previous works highlighted the negative impact of high thrombus burden within the culprit lesion on short- and long- term outcome during STEMI3 or NSTEMI. Thrombectomy techniques can improve these results by dramatically reducing thrombus load during ACS, but a complete disappearance is rarely obtained, and real benefits of the technique have recently been challenged20. Following thrombectomy, if there is no significant stenosis, the indication for stenting can be reviewed. Plaque erosion with a moderate stenosis may show spontaneous healing, scar formation and re- endothelialisation of the arterial wall, and both IVUS and OCT have provided information on plaque healing with medical therapy14. 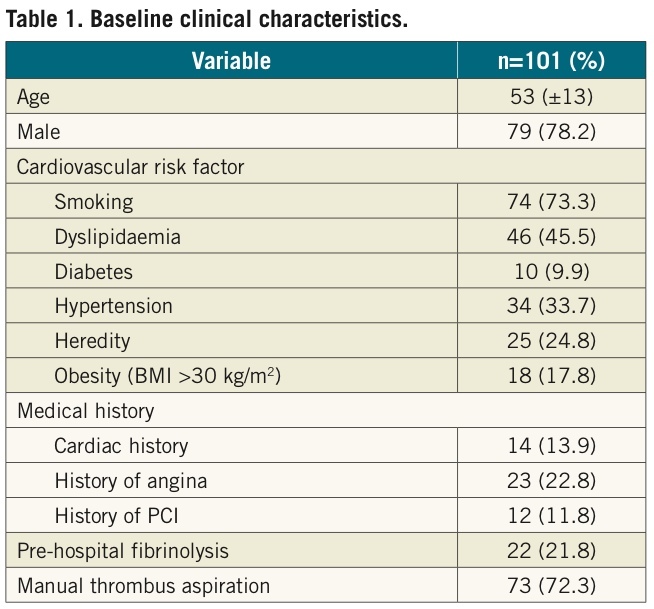 Thirty-eight of the present 101 patients were managed medically without stenting (38%). At 12-month follow-up, only one of the 38 showed evolution towards ischaemic stenosis, requiring stenting at six months. In the series as a whole, there were no acute events (ACS or sudden death). Previous studies investigated the feasibility of deferred PCI for STEMI treatment under optimal antithrombotic therapy, on the basis of angiographic findings only21,22. These series reported that this procedure could be performed safely in selected patients and also induced a decreased rate of culprit lesion stent- ing. Hence, Echavarria-Pinto and colleagues22 observed that stenting could be avoided in 29.2% of their patients, which is comparable to the present data. However, since our study did not include an angiography-only control group, further randomised controlled studies are needed to assess the influence of OCT-guided treatment decisions for stenting or not of culprit lesions. OCT-guided postponement of stent implantation was associated with good procedural outcomes: 100% success and no no-reflow events. The rate of malapposition was relatively low, at 17.5%, despite ACS being a known factor for malapposition17. Thrombus reduction allows stent diameter and length to be tailored to the lesion, minimising the risk of restenosis. Finally, postponement reduced the rate of bifurcation stenting: initial angiography implicated bifurcations in 36% of cases, whereas only 9% of patients actually needed bifurcation stenting. 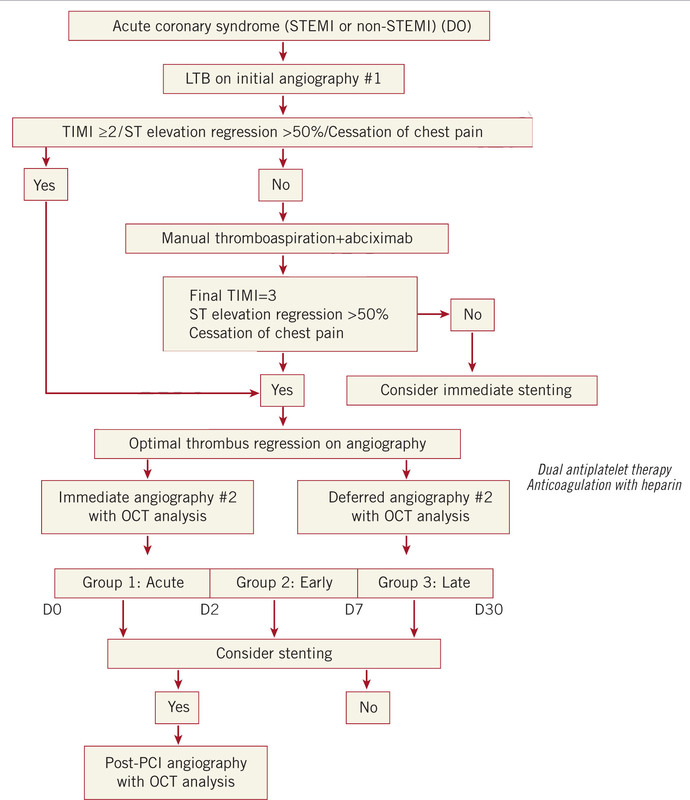 What is the optimal interval for the OCT “control” imaging in the two-step management of ACS? Analysing the three tertiles for the control imaging interval shows that thrombus burden tends to decrease over time according to thrombus length, maximum area or score. This reduction is associated with increased minimum lumen area and reduced percentage stenosis. This may account for the lower rate of stenting in the late-OCT group. (Figure 4). The main limitation of this study was the non-randomised design, meaning we cannot draw conclusions about the influence of OCT over angiography alone on treatment decisions or clinical outcomes. Moreover, the timing of the OCT procedure was empirically decided by the operator until one month. Our study was neither designed nor powered for a health outcome analysis. The study population included selected patients during routine clinical care (approximately 15% of all ACS cases admitted during the study period). Therefore, the conclusions in our study are relevant to patients with a large thrombus burden at initial angiography and should not be extrapolated to all-comer ACS patients, especially where initial thrombus burden is light. Moreover, patients from Group 1 underwent early OCT analysis: although white thrombus (which induces minimal backscattering attenuation) was identified in the vast majority of the cases, residual large thrombus burden might have affected the analysis of the underlying plaque morphology. Hence, this factor could potentially explain the lowest incidence of plaque rupture/erosion identified in these patients compared to the others and advocates for the need for delaying the OCT control from the acute event in order to assess properly the underlying morphol- ogy of ACS culprit lesions. Finally, the appropriate OCT criteria to decide whether the culprit lesion in ACS patients should be stented or not remains to be determined. Importantly, overall, stenting of culprit lesions represents the overall standard of care. In our study, we used a ratio between reference lumen area and minimum lumen area (MLA) to tailor PCI. Our proof-of-concept study was designed to assess feasibility and safety, and a larger substantive trial will be needed to evaluate the role of OCT-guided treatment decisions in ACS patients with large thrombus burden. A randomised trial with surrogate health outcomes, such as with MRI for infarct size at 30 days, may be the next logical step. OCT in ACS is feasible and complication-free. The present study demonstrated improved assessment of thrombus burden, which angiography tends to underestimate, and improved culprit lesion analysis. Following maximal thrombectomy, OCT allowed abstention from stenting in 38% of cases in this pilot study on a selected population. When indicated, stenting was reliable and perhaps better adapted to culprit lesion morphology. We believe a randomised controlled trial of an OCT-guided invasive strategy in ACS patients with LTB should determine the role of this technique in these indications. N. Amabile, G. Souteyrand, P. Motreff and C. Caussin received con- sulting fees from St. Jude Medical. G. Souteyrand and P. Motreff received consulting fees from Terumo. The other authors have no conflicts of interest to declare. 1. Singh M, Berger PB, Ting HH, Rihal CS, Wilson SH, Lennon RJ, Reeder GS, Bresnahan JF, Holmes DR Jr. Influence of coronary thrombus on outcome of percutaneous coronary angioplasty in the current era (the Mayo Clinic experience). Am J Cardiol. 2001;88:1091-6. 2. White CJ, Ramee SR, Collins TJ, Escobar AE, Karsan A, Shaw D, Jain SP, Bass TA, Heuser RR, Teirstein PS, Bonan R, Walter PD, Smalling RW. Coronary thrombi increase PTCA risk. Angioscopy as a clinical tool. Circulation. 1996;93:253-8. 3. Sianos G, Papafaklis MI, Daemen J, Vaina S, van Mieghem CA, van Domburg RT, Michalis LK, Serruys PW. Angiographic stent thrombosis after routine use of drug-eluting stents in ST-segment elevation myocardial infarction: the importance of thrombus bur- den. J Am Coll Cardiol. 2007;50:573-83. 4. Svilaas T, Vlaar PJ, van der Horst IC, Diercks GF, de Smet BJ, van den Heuvel AF, Anthonio RL, Jessurun GA, Tan ES, Suurmeijer AJ, Zijlstra F. Thrombus aspiration during primary per- cutaneous coronary intervention. N Engl J Med. 2008;358:557-67. 5. Cook S, Wenaweser P, Togni M, Billinger M, Morger C, Seiler C, Vogel R, Hess O, Meier B, Windecker S. Incomplete stent apposition and very late stent thrombosis after drug-eluting stent implantation. Circulation. 2007;115:2426-34. 6. Barlis P, Gonzalo N, Di Mario C, Prati F, Buellesfeld L, Rieber J, Dalby MC, Ferrante G, Cera M, Grube E, Serruys PW, Regar E. A multicentre evaluation of the safety of intracoronary optical coherence tomography. EuroIntervention. 2009;5:90-5. 7. Kubo T, Imanishi T, Takarada S, Kuroi A, Ueno S, Yamano T, Tanimoto T, Matsuo Y, Masho T, Kitabata H, Tsuda K, Tomobuchi Y, Akasaka T. Assessment of culprit lesion morphology in acute myo- cardial infarction: ability of optical coherence tomography com- pared with intravascular ultrasound and coronary angioscopy. J Am Coll Cardiol. 2007;50:933-9. 8. Jang IK, Tearney GJ, MacNeill B, Takano M, Moselewski F, Iftima N, Shishkov M, Houser S, Aretz HT, Halpern EF, Bouma BE. In vivo characterization of coronary atherosclerotic plaque by use of optical coherence tomography. Circulation. 2005;111:1551-5. 9. Bouma BE, Tearney GJ, Yabushita H, Shishkov M, Kauffman CR, DeJoseph Gauthier D, MacNeill BD, Houser SL, Aretz HT, Halpern EF, Jang IK. Evaluation of intracoronary stent- ing by intravascular optical coherence tomography. Heart. 2003;89:317-20. 10. 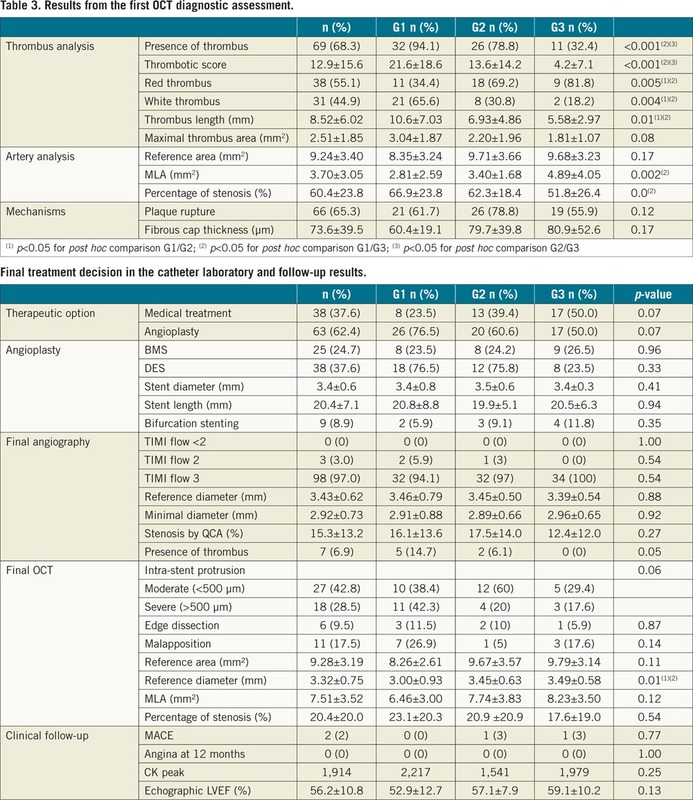 Yao Z, Matsubara T, Inada T, Suzuki Y, Suzuki T. Neointimal coverage of sirolimus-eluting stents 6 months and 12 months after implantation: evaluation by optical coherence tomography. Chin Med J (Engl). 2008;121:503-7. 11. Prati F, Guagliumi G, Mintz GS, Costa M, Regar E, Akasaka T, Barlis P, Tearney GJ, Jang IK, Arbustini E, Bezerra HG, Ozaki Y, Bruining N, Dudek D, Radu M, Erglis A, Motreff P, Alfonso F, Toutouzas K, Gonzalo N, Tamburino C, Adriaenssens T, Pinto F, Serruys PW, Di Mario C; Expert’s OCT Review Document. Expert review document part 2: methodology, terminology and clinical applications of optical coherence tomography for the assessment of interventional procedures. Eur Heart J. 2012;33:2513-20. Coherence Tomography (IWG-IVOCT). Consensus standards for acquisition, measurement, and reporting of intravascular optical coherence tomography studies: a report from the International Working Group for Intravascular Optical Coherence Tomography Standardization and Validation. J Am Coll Cardiol. 2012;59: 1058-72. 13. Virmani R, Burke AP, Farb A, Kolodgie FD. Pathology of the vulnerable plaque. J Am Coll Cardiol. 2006;47:C13-8. 14. Prati F, Uemura S, Souteyrand G, Virmani R, Motreff P, Di Vito L, Biondi-Zoccai G, Halperin J, Fuster V, Ozaki Y, Narula J. OCT-based diagnosis and management of STEMI associated with intact fibrous cap. JACC Cardiovasc Imaging. 2013;6:283-7. 15. Vengrenyuk Y, Carlier S, Xanthos S, Cardoso L, Ganatos P, Virmani R, Einav S, Gilchrist L, Weinbaum S. A hypothesis for vulnerable plaque rupture due to stress-induced debonding around cellular microcalcifications in thin fibrous caps. Proc Natl Acad Sci U S A. 2006;103:14678-83. 16. Claeys MJ, Bosmans J, Veenstra L, Jorens P, Raedt HD, Vrints CJ. Determinants and prognostic implications of persistent ST-segment elevation after primary angioplasty for acute myocar- dial infarction: importance of microvascular reperfusion injury on clinical outcome. Circulation. 1999;99:1972-7. 17. Kim JS, Fan C, Choi D, Jang IK, Lee JM, Kim TH, Park SM, Paik SI, Ko YG, Hong MK, Jang Y, Chung N. Different patterns of neointimal coverage between acute coronary syndrome and stable angina after various types of drug-eluting stents implanta- tion; 9-month follow-up optical coherence tomography study. Int J Cardiol. 2011;146:341-6. 18. Isaaz K, Robin C, Cerisier A, Lamaud M, Richard L, Da Costa A, Sabry MH, Gerenton C, Blanc JL. A new approach of primary angioplasty for ST-elevation acute myocardial infarction based on minimalist immediate mechanical intervention. Coron Artery Dis. 2006;17:261-9. 19. Freixa X, Belle L, Joseph L, Tanguay JF, Souteyrand G, L Allier PL, Jolicœur EM. Immediate vs. delayed stenting in acute myocardial infarction: a systematic review and meta-analysis. EuroIntervention. 2013;8:1207-16. 20. Frobert O, Lagerqvist B, Olivecrona GK, Omerovic E, Gudnason T, Maeng M, Aasa M, Angerås O, Calais F, Danielewicz M, Erlinge D, Hellsten L, Jensen U, JohanssonAC, KåregrenA, Nilsson J, Robertson L, Sandhall L, Sjögren I, Ostlund O, Harnek J, James SK; TASTE Trial. Thrombus aspiration during ST-segment elevation myocardial infarction. N Engl J Med. 2013;369:1587-97. 21. Escaned J, Echavarría-Pinto M, Gorgadze T, Gonzalo N, Armengol F, Hernández R, Jiménez-Quevedo P, Nuñez-Gil IJ, Pérez- Vizcayno MJ, Alfonso F, Bañuelos C, Ibañez B, García E, Fernández- Ortiz A, Macaya C. Safety of lone thrombus aspiration without concomitant coronary stenting in selected patients with acute myo- cardial infarction. EuroIntervention. 2013;8:1149-56. 22. Echavarría-Pinto M, Lopes R, Gorgadze T, Gonzalo N, Hernández R, Jiménez-Quevedo P, Alfonso F, Bañuelos C, Nuñez- Gil IJ, Ibañez B, Fernández C, Fernandez-Ortiz A, García E, Macaya C, Escaned J. Safety and efficacy of intense antithrom- botic treatment and percutaneous coronary intervention defer- ral in patients with large intracoronary thrombus. Am J Cardiol. 2013;111:1745-50.